Australia’s mining investment boom is coming off the boil, but slowly according to the latest ABS investment intentions survey. Applying the usual realisation ratios ANZ Bank says mining investment this financial year should be 40 per cent higher than last year’s record $81 billion - a stellar result, but down on 45 per cent higher implied by the previous survey conducted three months ago. “This confirms our view that many of the resource investment projects over 2012-13 are either committed or under construction,” said senior economist Justin Fabo. Actual mining investment surged 72 per cent in the year to June, 10 per cent of it in the June quarter. Capital spending in all other industries combined slid 4.8 per cent, most of it in the June quarter. Analysts expecting a much sharper collapse in mining investment than the usual realisation ratios suggest point to the winding back of expectations between the March and June quarters, the first such decline since 1998-99. AMP Capital economist Shane Oliver said the mining investment boom still had “another year or two to go” but the peak was starting to come into sight.
. How big is Australia's LNG boom? Australia faces a run on its currency, a deeper collapse in housing prices and a bank funding crisis to rival Europe’s as it attempts to come to grips with life after the mining boom, according to a widely-circulating report from a boutique US advisory firm. 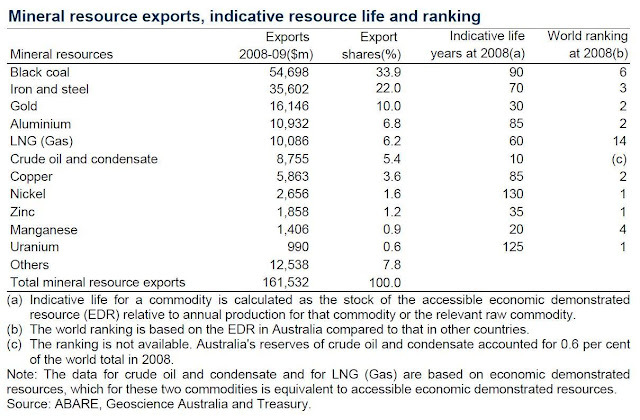 Entitled Australia: The Unlucky Country the report from Variant Perception argues Australia faces a classic case of Dutch Disease, the erosion of capability that flows from a resources boom and an overvalued exchange rate. “The mining sector has crowded out almost all other sectors of the economy and also funnelled credit and liquidity into a housing bubble in the real estate sector,” the report says. The Australian dollar is overvalued on most metrics, one being the hamburger-based Big Mac Index which has the Aussie 15 to 20 per cent above par, Variant says. But it will need to fall well below par and stay there for some time for the rest of the economy to come to the fore after mining retreats. Variant says the Reserve Bank will come to come to the rescue of the big four Australian banks in a crisis because they are too important to fail, “either by aggressively cutting interest rates or propping up banks through domestic open market operations akin to the liquidity injections seen by the European Central Bank”. “Quantitative easing is also a possibility if the RBA is forced to buy bank debt to try to stave off a financial crisis. Under such a scenario, the Australian dollar would fall considerably,” the report says. Australian analysts dismissed many of Variant’s conclusions as nothing new. “They’ve discovered the current account deficit,” said one. “We discovered it in the 1980s and got on with our lives. June construction figures released yesterday show housing at its lowest in a decade, down 15 per cent from its peak two years ago. Non-residential building fell almost 20 per cent after the windup of the building the Education Revolution program. Engineering remained near record highs. Australia has been described as the lucky country, but it is running out of luck and has a terrible combination of fundamental factors. In fact, Australia reminds us in many ways of the housing bubbles in the UK, Spain and Ireland. In each case, the country experienced a banking crisis. Australian growth has been dependent on two huge bubbles: a domestic housing market that is one of the most overvalued in the world and a reliance on the Chinese fixed asset investment craze. Despite extraordinary commodity exports, Australia has run current account deficits and has a terrible international investment position. A substantially weaker currency in Australia is inevitable given fundamental factors. Oversized banks dependent on external financing, a bursting housing bubble and a slowing Chinese economy are all fundamental factors which are likely to weigh on the currency. As we explain, a weaker currency can either come in the form of the Reserve Bank of Australia (RBA) reducing interest rates or a balance of payment-like crisis in which foreigners pull funding from the banking sector. In both cases, the RBA would likely have to expand domestic liquidity substantially to prop up the banking system. Please visit our website for the full version of the report. > Australia is a classic case of the Dutch Disease. The Dutch Disease denotes the loss of competiveness in the tradable manufacturing and industrial sector as a result of a resource/commodity boom which leads to an overvalued real exchange rate. In Australia, the mining sector has crowded out almost all other sectors of the economy and also funnelled credit and liquidity into a housing bubble in the real estate sector. > Australia net external debt levels resemble those seen in the European periphery; the currency is fundamentally vulnerable. Australia has been running a persistent current account deficit since 1980 and the country's negative net international investment position is one of the largest in the world. On this background, the strong currency makes no sense and fundamentally the currency is very vulnerable to capital flight from the banking system. > Australian banks and corporates rely heavily on foreign funding; the RBA will have to provide liquidity through LTROs. Structural global deleveraging and stop-go flows add volatility for Australian banks. As the housing market continues to correct, it may be difficult for Australian banks to fund themselves. Lowering interest rates will hurt the margins of the banks, and the RBA will likely be forced into domestic liquidity operations to prop up its banks. > Two options to weaken the currency, lower rates or a balance of a payments crisis. The Australian currency will weaken in one or two ways. Either the RBA gradually reduces interest rates to accommodate a structurally slowing economy and a relative end to the mining boom or the economy will suffer from a balance of payment crisis as external financing dries up due to the decline in the terms of trade exposing the negative current account. > Australia's commodity sector is tied to a structurally slowing Chinese economy. The commodity sector remains a force to be reckoned with in Australia and will remain cyclically tied to China. Still, the Chinese economy is structurally slowing down and this will impact the growth rate of mining and resource related activities in China. Australia is likely sitting on significant overcapacity in the mining sector which will be difficult to transfer to other sectors. > The Australian consumer is overlevered, but demographics are relatively positive going forward. The correction in the Australian housing market is far from over and the Australian households remain overlevered. Yet, the savings rate has already increased substantially and in the long run demographics look far more robust than in eg Europe. > Stay long government bonds in Australia on convergence towards low interest rates in the rest of the OECD. Whether it be as a result of the RBA gradually cutting rates to reflect slower growth or because foreigners start bidding up Australian bonds due to carry, yields are going down in Australia. We continue to like being long government bonds in Australia. > Our long-term technical buy signal on Australian equities is in effect, but avoid miners and banks. We currently have a long term technical buy signal in effect on Australian equities as a result of the recent sharp sell-off. This is usually followed by good returns over the next 6 months or so. Although the market cap on the ASX 200 strongly favours overweight in mining and financials (market weight), we would avoid these two sectors and buy into defensives (consumer staples and health care) as well as industrials. > Industrials and manufacturing will outperform on lower interest rates and a weaker currency. The gradual end to Dutch Disease will eventually lead to outperformance of the industrial sector. In the long run, our view is that the Australian equity market cap will re-weight away from mining and financials towards industrials and eventually consumer and retail. > Buy CDS on big four Australian banks. Australian banks remain the weakest link in Australia's economy, and they are too big to fail. We like buying CDS on Australian large cap banks as an outright trade or as a hedge against the long-term technical buy signal on Australian equities mentioned above. The Australian economy needs a substantially weaker currency to regain competitiveness outside the mining sector. As we detail below, this can happen either through the RBA reducing interest rates or through a balance of payment type crisis in which foreigners pull funding. In either case, the Australian dollar is set to weaken substantially. Australia is likely to have built up significant overcapacity in mining relative to a global demand. In short, it is a bubble that is in the process of bursting. Economic growth in Australia has been largely driven by two booming sectors, mining and construction (housing and real estate). Since 1989, mining and construction capex have increased by a factor of 4 and 2.5 respectively. Both of these, however, are now no longer viable as growth engines. Australia is a classic case of the Dutch Disease, which is the process by which a resource boom leads to an appreciation in the currency that stifles the tradable sector (manufacturing). Classic cases of Dutch Disease are associated with excessive wage growth in the non-tradables sector leading to an appreciation in the real exchange rate. The adverse macroeconomic effects include potential overconsumption relative to future income and significant mis-allocation of capital as the windfalls from commodity exports are channelled into non-tradables (eg real estate and construction) where the risk of asset bubbles is high. The Australian dollar is vastly overvalued on any fundamental metric. Australia's terms of trade have soared and the currency is overvalued on most metrics. On The Economist's famous Big Mac Index, the AUD is about 15% to 20% overvalued. Given the country's persistent current account deficit and large external debt load the currency looks vulnerable based on macroeconomic fundamentals. But the problem isn't so much that Australia's currency is currently overvalued based on fundamentals, but that the economy is likely to need an undervalued currency for an extended period in order to rise to the challenge of correcting the damage inflicted by the Dutch Disease. It will be almost impossible to move mining capacity to other sectors in Australia. This is a textbook problem for economies who suffer from Dutch Disease. When the hangover arrives, writing off production capacity is often done at a considerable discount to cost. In addition, the manufacturing sector is under-developed and will not be able to take up the slack for the loss of momentum in construction and mining. The European periphery is an economic basket case. Australia resembles the European periphery in many important ways. The Australian banking system is highly reliant on external funding and will likely become dependent on the central bank for liquidity in the near future. Our view is that the RBA will have to become much more activist in supporting its major banks as the structural slowdown in China and the housing market continues. We believe the RBA will ultimately be forced to take similar action to developed market central banks either by aggressively cutting interest rates or propping up banks through domestic open market operations akin to the liquidity injections seen by the ECB. Quantitative easing is also a possibility if the RBA is forced to buy bank debt to try to stave off a financial crisis. Under such a scenario, the AUD would fall considerably. The crisis-stricken economies along the eurozone periphery share one key characteristic: their external debt is too high and their net international investment position (NIIP) - measuring the difference in stock value between assets held abroad and asset held domestically by foreigners - is deeply negative. Yet, a closer look and you will find Australia and its neighbour New Zealand in the same company, with negative NIIPs well above countries such as Turkey and Brazil. Australia's current account has been negative since 1980, but the interesting thing is that it has remained negative even as the export mining boom has accelerated in the past decade. This is similar to South Africa, that has also run current account deficits for most of the last decade – despite having a sizable export sector – as consumers essentially borrow to spend. The remarkable fact is that while Australia's trade balance with China has risen steadily to reflect the mining boom (see sections below), the overall trade balance has not been consistently positive (quite the opposite). As Australia's terms of trade starts to decline or even stops growing, the current account balance will become even more exposed due a now structurally negative income balance. This will add further fundamental pressure on the currency. The majority of Australia's external debt is held in the country's banking sector with banks' gross external debt standing at around 45% of GDP in 2012. Both Australian banks and Australian corporates are highly dependent on international funding for their financing operations with funding costs proxied by the basis swap (essentially what an Australian bank has to pay for USD funding). However, based on the latest data from the RBA, the funding profile has improved in the past two years with deposits now accounting for a larger share of the total funding profile. Furthermore, the maturity of external wholesale debt has been extended significantly. A total funding need from external sources at 40% of total funding is extraordinarily high. Moreover, about half of this external debt is short term. This increases risk yet further should Australia face a funding shock, driven either by events at home (a severely slowing economy), or abroad (eg a euro-driven credit event). Cost of funding for Australian banks have gone up markedly since mid-2011 as competition for deposit funding has pushed up costs of term deposits. In addition, extending maturity on wholesale funding has also proven costly especially in relation to a heightened risk premium attached to bank credit in general, as well as the fact that many of the big Australian banks were recently downgraded by S&P. In the event of a funding crisis, it is unthinkable that Australian banks would be left to the whims of international funding markets. There are two reasons for this. Firstly, the Australian banking system is essentially an oligopoly with four main big players, each of them systemic on their own. Their combined market cap is just shy of a fifth of GDP and their total assets, in combination, equal an impressive 183% of GDP (based on annualised Q1-12 GDP figures). Secondly, Australia is not in the same boat as the European periphery. It is much more like the UK in 2007. The RBA has full control of its balance sheet (and currency) and has all the tools it needs to inject liquidity into banking system through LTRO-type operations. Moreover, if there was any sudden fall in dollar funding for Australian banks it is likely the Fed would step in with dollar swap lines, as it has done with the BoE and the ECB. Ultimately, our view is that the Australian economy is very similar to the UK economy in several respects (overvalued property market, excessive household debt, etc). In part, as a result of the mining boom and as a result of low global interest rates in the past decade, Australia has also had a severe housing bubble. This bubble is now in the process of deflating. There is considerable deleveraging ahead for the Australian consumer with household debt still at significant levels. Australian consumers remain overlevered with especially mortgage debt as a percentage of income still high, but the savings rate has also increased and looks to be sitting at a permanently higher level than seen at any point since 1990. The RBA has openly stated that it is not worried about a slowdown in the Australian housing market, but as the slowdown grinds on it will be difficult for them not to take notice. A final note from GMO, the investment management firm. They did a study on bubbles and identified – using their definition for what a bubble is – 34 bubbles over the years. 32 of these are back to the trend from before the bubble began. The only two outstanding are the UK housing market and the Australian housing market. Australia will continue to be cyclically tied to China, but structurally the economy is likely to suffer from substantial overcapacity relative to a slowing Chinese economy. China's structural growth rate is likely to fall significantly in the coming years and investment growth will wane. This is bearish for the Australian mining sector. The best way to show the connection between growth in Australia and China is to overlay our leading indicator for industrial production in China with annual changes in the AUDUSD. The strong correspondence between the charts clearly shows that the currency has been tightly correlated to the cycle in China in the last decade. The chart to the right shows a very high correlation between the Chinese and Australian business cycle. The Australian trade balance with China has continued reaching new highs in the first half of 2012, and while the Chinese economy may certainly rebound in relative terms, Australia's strong dependence on China will turn into a disadvantage as the Chinese economy slows down. There is no doubt that China may have had its best years in terms of headline GDP growth, but it is unlikely in our view that the economy will wither away as an important component of the global business cycle. Cyclically, Australia will continue to benefit from expansions in China, but structurally, Australia will suffer as the trend growth of the Chinese economy slows down. For Australia, the main problem lies in the structural slowdown that we are likely to see in China. Chinese GDP growth increased from about 6-7 % to a peak of 14% before the crisis. Growth rebounded to above 10% in the first half of 2010, but the country has not been able to sustain this rate. The Australian currency has continued to defy the vulnerabilities of the economy and instead responded to the search by international investors for carry and yield. In a world where developed market interest rates are zero or even negative, the Australian dollar has become an attractive, and indeed one of the only, sources of yield. A weaker currency is necessary for the unwind of Australian Dutch Disease and in our view, there are two avenues through which this can occur. 1. Economic headwinds in the form of a slowing Chinese economy and a continuing slump in the domestic housing market will force the RBA to reduce interest rates further. Given the impact this would have on domestic banks' interest rate margins, the RBA would likely have to aid banks with liquidity and funding through LTRO-like operations akin to the ones seen at the ECB. 2. A classic balance-of-payments type crisis in which a continuing decline in the terms of trade exposes the vulnerability of the external position. The current account would widen, and Australian banks would find it difficult to secure international wholesale funding. In such a situation, the RBA could choose to invert the domestic yield curve to attract funding for the current account (essentially protecting the currency), but this is very unlikely in our view. Australia would in such a case benefit from a weaker currency and the path of least resistance would be for the RBA to support the banks directly through LTROs and thus replace the source of external funding. The critical issue in the scenarios above is whether policymakers actively seek to weaken the currency before the market does. Given the current tone set by the RBA, option two seems most likely, but rates have already come down and the RBA is likely to continue to lower interest rates if the economy weakens further. A caveat is that in any crisis-like situation, given the central role of the domestic banks and their reliance on external funding, interbank rates would likely rise much higher. In this case, buying bank bill futures would be inappropriate to profit from lower base rates as the analogue of the LIBOR-OIS spread fro Australia would widen significantly, as we saw in the US, UK, etc in the wake of the Lehman bankruptcy. However, as bank bill futures in Australia are physically delivered, as opposed to cash settled, spreads may not widen to such extreme levels. On bonds, we have advised investors to go long Australian bonds as we called for the RBA to cut rates. Now we can add an additional impetus in the form of the continuing strong bid by foreigners. The search for yield and essentially diversification out of sovereign debt markets in distress has led to a surge in the foreign holdings of Australian government bonds. According to the latest data from the Australian Office of Financial Management, the total foreign ownership of Australian government bonds now stands at 80% of the total outstanding debt, up from 60% in 2006. Although this may sound high, government debt to GDP in Australia is low, at 30% (although is up from 16% in 2008). This low ratio is a result of running a budget surplus for most of the last 15 years. But, even though the situation looks good optically, the fact of the matter is Australia would have to backstop its banks in the event of a crisis, and this low number masks the real debt burden. Two countries that also had low debt burdens before banking crises were Spain and Ireland. They've both required bailouts, so Australian politicians and economists should not be complacent about their public debt levels. We remain of the view that rates in Australia will converge to the lower bound currently set by the rest of major central banks. This process has been progressing for the last 6m-12m and in our view it will continue. The Australian yield curve is considerably flatter than in the rest of the developed world. We think this will also reverse as short-term interest rates come down on the back of foreign buying and a dovish RBA. The Australian dollar will not continue to defy fundamentals even if foreign central bank diversification means that the currency continues to see bids driven by structural as well as cyclical forces. We believe that the recent compression in the yield differential will weaken the AUD. Australian banks will suffer. Indeed, Australian banks have recently outperformed their developed world peers but this is not sustainable given their vulnerability to external funding conditions and a slowing domestic market, putting a pressure on earnings. Relative to their base value in 2007 we believe that Australian banks should trade much closer to their UK rather than their US counterparts. We like buying CDS on Australia's big four banks both as an outright trade, but also as a hedge against a long index exposure (on the basis of a long-term technical buy signal - see full report for details).
. Leigh on Australia so far. What to Eat After the Low-Hanging Fruit? It’s easy to laugh at big tobacco. Fresh from defeat at Australia’s High Court it has taken its fight against plain cigarette packets to New Zealand where British American Tobacco warns such legislation could expose the nation to legal challenges (no kidding) and to Hong Kong where Philip Morris moved the shares of its Australian subsidiary presumably to take advantage of an obscure 1993 Hong Kong-Australia investment treaty. Philip Morris Australia, now known as Philip Morris Asia, will argue the treaty prevents Australia from depriving a Hong Kong entity of its investments or subjecting it to “measures having effect equivalent to such deprivation”. Which it does, with a caveat. As a party to the treaty Australia is permitted to deprive a Hong Kong company of its investments so long as it does so “under due process of law for a public purpose related to the internal needs of that party on a non-discriminatory basis”. So Australia ought to be in the clear. But the almost comic attempt to get mileage out of the treaty (moving from Australia to Hong Kong in order to complain that it was being discriminated against because it was from Hong Kong) masks a broader more serious attempt to turn trade treaties into instruments that allow corporations to sue governments. The World Trade Organisation allows no such thing. It’s disputes settlement procedure allows a nation to haul another nation before a disputes settlements panel, but not corporation to do so. The dispute will take four months to hear. With appeals it could take up to 14 months. But it won’t unduly trouble Australia. 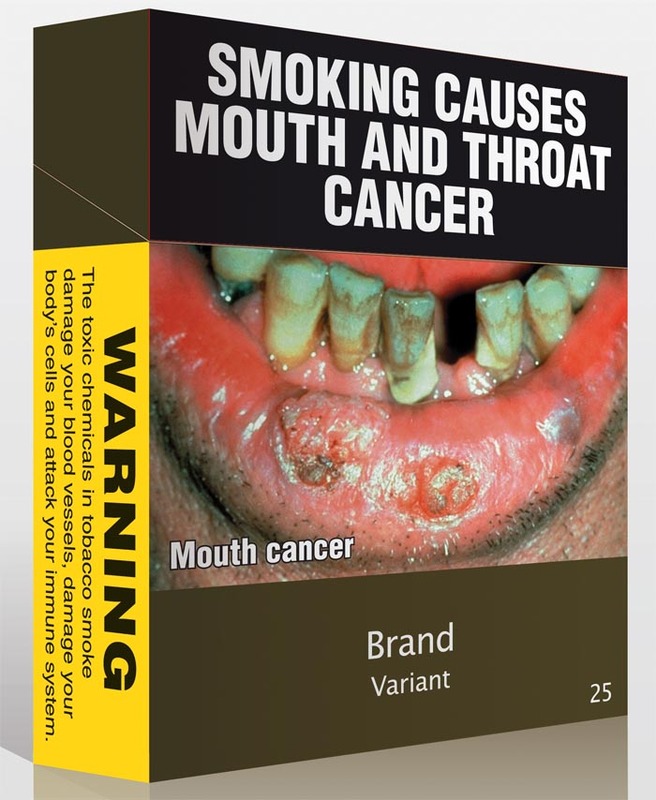 A member of the WTO rather than a corporation will be taking action, it will have to show clearly how Australia’s plain packs law offends against WTO rules (which allow non-discriminatory measures that benefit health) and because the Ukraine’s national interests are not at stake it is likely to run out of enthusiasm before Australia does. Big tobacco, and fellow travellers in surprising places, want much more. They want what is known as an Investor State Dispute Settlement Mechanism. They want it in order to allow them to drag Australia and other sovereign governments before specially constituted international courts. They don’t usually put it that bluntly. It is clear what Philip Morris is getting at. 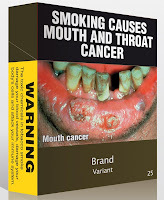 Four of the 30 paragraphs in the briefing note seen by BusinessDay complain about Australia’s plain packaging law. As it happens, the US trade representative is unable to do the bidding of Philip Morris. US law prevents federal agencies from promoting the sale of tobacco overseas. But the trade representative is willing to do the bidding of other corporations that would like to sue foreign governments in supranational courts. In fact in all but one of the 13 free trade agreements negotiated by US, its representatives have managed to insert such a clause. The exception is the free trade agreement with Australia. Although criticised at the time for giving too much away to the United States in return for very little, on the question of an outside Investor State Dispute Settlement Mechanism the Howard government stood firm. The Gillard government is standing firm too. The multinational nature of large Australian corporations means it would be effectively be giving our corporations (but not our citizens) an international right of appeal against laws approved by the High Court. The US is unlikely to give up. It already has such a clause in its agreements with Canada, Chile, Mexico, Singapore and Peru - five of the nations that would form part of the Trans Pacific Partnership. It’s best hope would be that a new Abbott government saw things differently. It would, if it succumed to lobbying from Australia’s own Chamber of Commerce and Industry. ACCI is lobbying hard, putting out a statement this month headed crudely: “Australian Foreign Investment Requires Right to Sue Foreign Governments”. It says its “campaign” is backed by the International Chamber of Commerce, which is hardly surprising but also hardly a sign the backers have Australia’s interests at heart. Julia Gillard and trade minister Craig Emerson are standing up to them. Will Tony Abbott?
. Plain Pack wars: The Dominican Republic takes on Australia! Shocking previously-unpublished research commissioned for the government’s review of pensions finds one in ten Australians on the dole are unable get a substantial meal each day, one in eight are unable to buy prescribed medicines, and one in twenty cannot heat their homes. Commissioned by the department of families, housing, community services and indigenous affairs for the 2008 Harmer Review of Pensions conducted by the then head of the department Jeff Harmer it finds that aged pensioners are much better off than unemployed Australians on Newstart. Whereas 1.4 per cent of aged pensioners surveyed were unable to get medical treatment if needed, among Australians on Newstart the proportion was 22 per cent. Whereas only 0.7 per cent of aged pensioners were unable to get a substantial meal at least once a day among Australians on Newstart the proportion was 10.3 per cent. Only 2.1 per cent of pensioners were unable to buy the medicines prescribed for them by doctors. Among unemployed Australians on Newstart the proportion was 16.7 per cent. Asked by the department to examine the adequacy of the payments “to different groups, including aged pensioners” the research compares what it calls deprivation rates among seven groups, including low-wage workers, self-funded retirees, age pensioners and Australians on Newstart. It finds that on almost every criteria self-funded retirees are the best off and Australians on Newstart the worst off. So well-off does the research find self-funded retirees that on most of the criteria they have no deprivation at all. An exception is dental care where 2.1 per cent say they can’t get access to treatment if needed. By contrast 13.7 per cent of age pensioners can’t get access to dental treatment if needed and 44.7 per cent of Australians on Newstart. 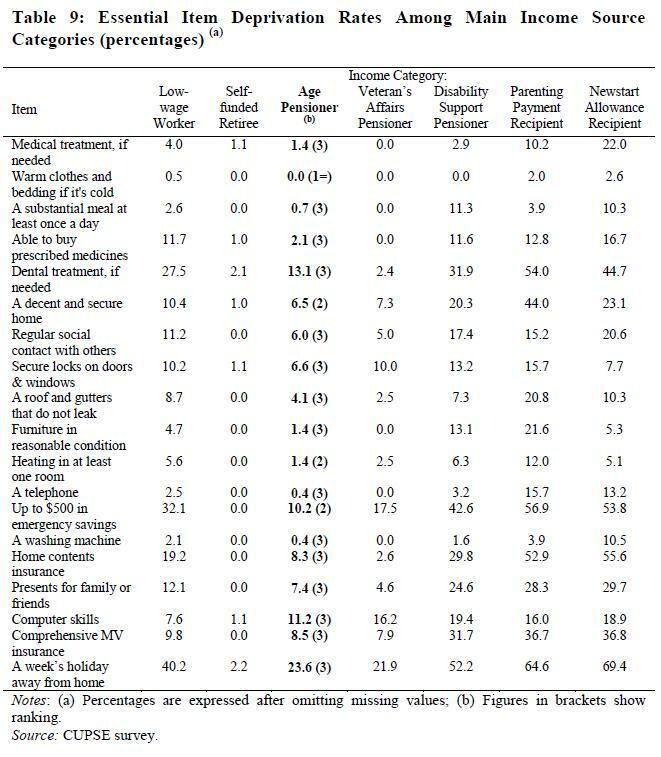 The research finds that “although the results do not necessarily imply anything about whether or not the age pension is adequate at current levels, it does appear to be the case that the age pension is more adequate than the existing payments made to people with a disability, parenting payments, and those whose eligibility for income support is a consequence of unemployment”. Assisted by the previously unseen report the Harmer Review found pension rates should continue to be adjusted by average male earnings or the cost of living, whichever was the larger. It made no finding about Newstart - found to be far less adequate - because Newstart was outside of its terms of reference. The $35 per day Newstart allowance continues to be adjusted by the much lower consumer price index. The most recent increases in March gave an extra $3.35 per week to pensioners but just $1.45 per week to NewStart recipients. The finest speech Nixon never gave. What if Armstrong had died on the moon? In the words of one commenter: I can imagine Safire writing this, privately pondering the etymological connections of lunar and lunacy. In a genre that requires weight and sober rhythm, it is beyond effective. In the words of another: Did Bowie get an advance copy? Australia's mining boom was never going to last forever. Tucked away in the budget papers two years ago were estimates from Treasury and Geoscience Australia about how long each of the nation's minerals would last. Iron ore was set to run out in 70 years at the current rate of extraction, gold in just 30 years. Black coal would last longer - 90 years, meaning many very young Australians will still be alive when the last known lumps of black coal are dug from Australian soil and thrust into furnaces. Treasury was careful to say its estimates weren't definitive. Higher prices could "encourage greater investment in exploration activities and new discoveries". But its message was clear: mining would be unable to power Australia's economy forever. Sooner or later - within one lifetime or maybe two - we would have to face up to the question of what comes next. It's the sort of question Australia has faced in the past. Those who grew up in the 1950s were forever being told the nation rode on the sheep's back. Back then the farm sector accounted for one-quarter of Australia's production. Today it accounts for a little over 2 per cent. On Thursday, the Resources Minister, Martin Ferguson, appeared to ring in the next change. Speaking to the ABC's AM program after BHP shelved plans to build what would have been the world's biggest uranium mine at Olympic Dam in South Australia's arid north he declared the boom over. "It's about time Tony Abbott stopped talking down Australia both at home and internationally and recognised how well placed we are," he said. "But you've got to understand, the resources boom is over. We've done well - $270 billion in investment, the envy of the world. It has got tougher in the last six to 12 months. Look at Europe, the state of the European and global economy. Think about the difficulties in China, with still strong growth. The next round was always going to be difficult and I must say Olympic Dam was always a very, very challenging project - its sheer size." "He has indicated that prices have come off a bit - or, if you like, that the commodity price boom has passed its peak," she told Parliament. "But there is a huge investment phase with still some way to run and the export boom in resources still has a very long way to run." The simultaneous industrialisation of the world's two most populated nations - China and India - has decades to run. Another 1.1 billion Asians are expected to move to cities over the next 30 years and they will require housing and supporting infrastructure. The Reserve Bank has estimated a typical Chinese apartment requires about six tonnes of steel, while 10 kilometres of metropolitan subway requires about 75,000 tonnes. Each tonne of steel produced requires about 1.7 tonnes of iron ore and more than half a tonne of coking coal. Resources exports have forged deep economic ties between Australia and Asia. But the mining boom may just be the prelude to the main game of Asia's economic emergence. By the middle of this century, more than half of the world's economic activity will occur in Asia. This landmark shift creates economic possibilities unimagined even a decade ago. As the region's middle class becomes richer, demand for a long and different menu of Australian exports including foodstuffs, tourism, education, financial services, business services, professional services and niche manufactures will steeple. But the shift from selling Asian customers bulk commodities such as coal, iron ore and gas to the far more nuanced task of exporting a wide range of goods and services into diverse Asian markets won't be easy. "It is one thing to sell a homogenous minerals commodity to a minerals-hungry industrialist in China, and another thing entirely to design and market a sophisticated personal service to someone living in that culture," the former Treasury secretary Ken Henry said in a speech to business this week. Australians have become much more aware of Asia, especially through holiday travel. But experts warn our knowledge is superficial. Even though so many more of us are travelling to Indonesia and other south-east Asian destinations there are fewer students studying Indonesian now than in the 1970s. A recent business survey found less than half of Australian businesses with dealings in Asia have any senior executives or board members with Asia experience or language ability. Asia's middle-classes are emerging as the world's biggest consumer group but many of them won't speak English. They will also have business cultures and political systems very different from Australia's. Henry, who is writing the government's white paper on preparing Australia for the Asian century, says the nation needs to build its "Asia-relevant capabilities". It will be crucial that Australian students gain a much deeper understanding of the culture and languages of Asia. Businesses will also need to think differently. Many firms that are defined as Australian will have to start looking at themselves as regional and be willing to move components of their business to Asia in order to survive. It was kicked off last decade by an explosion of urbanisation in China. The first impact was to ramp up prices. With Australia and suppliers in Brazil and India ill-prepared, the only way China could get the iron ore it needed to cater for its rapidly expanding cities was to bid up the price from a long-term average of about $US13 a tonne in 2002 to an extraordinary $US180 a tonne by 2011. For Australian miners the undreamt of price was pure profit - they hadn't needed to spend an extra cent to get it, which is why Kevin Rudd and Wayne Swan wanted to tax some of it away as super profits. But as miners across the world have ramped up production, prices have eased. A year ago iron ore was fetching about $US180 a tonne but yesterday the price slipped below $US100 for the first time since the global financial crisis. Investment will turn down soon. The Reserve Bank governor, Glenn Stevens, told Parliament's economics committee yesterday he expects investment spending to peak "within the next year or two" although it will remain at an unusually high level for a long time. Big investments in gas production means exports are set to quintuple by the end of this decade. But Peter Coleman, the chief executive of Woodside Petroleum, Australia's biggest gas producer, says that as commodity prices fall miners are becoming more cautious about investments. "We're just seeing a natural part of the cycle to be honest, it's kind of like that long wave that comes into the beach, it's starting to break, that's what commodity cycles do, and then we'll pick up another one here soon, it just depends on picking the right one." But even if the resource price boom is over and the resource investment boom coming to an end, our resource income boom still has some way to run. This payoff from the investment boom - the extra resources Australia is able to ship out of the country - will stay with us for decades. After China will come India. China has just passed a historic milestone: one half of its population now live in cities. India's rate of urbanisation is just a third so it has a long way to go. In the past 15 years India has shot up from being the world's 10th-biggest steel producer to the fourth. While India is blessed with vast reserves of its own high quality iron ore, it is desperately short of the coking coal traditionally used to turn it into steel. Australia, with its abundant stocks of coking coal, looks to be in the box seat once more. It already exports more coal to India than China. Even so, a director at Deloitte Access, Chris Richardson, says there could be a "tricky phase" for the Australian economy as commodity prices fall and we wait for recent investment in mining capacity to come on line. "In late 2014 going into 2015 we are going to have to change gears from construction as an economic driver to export earnings," he said. "There could be a pothole. We don't know how big it will be." Some parts of the economy will benefit as the effects of the mining boom fade a little. The Australian dollar will probably fall providing a boost to important sectors that have been badly affected by the high exchange rate like tourism, education and parts of manufacturing and retail. The firms in those sectors that have weathered the effects of the soaring exchange rate are likely to thrive if the dollar pulls back. Meanwhile, Henry says there is no room for complacency. Australia should waste no time adapting and reforming its policy settings to make the most of opportunities beyond the mining boom. "It would be a mistake to think that geography and/or geology alone will get us where we want to go and allow Australia somehow to ride the wave of the Asian century around us," he said. Why we face a flood of economic refugees: We can't control our borders. Australia is facing a flood of economic refugees. But the big numbers aren’t from the north, they are from the across the Tasman where Statistics New Zealand yesterday announced the biggest exodus to Australia on record. An extraordinary 53,900 New Zealanders moved to Australia in the year to July - around the entire population of New Plymouth, New Zealand’s eleventh biggest city. The number dwarfs the 9607 asylum seekers who arrived in Australian waters by boat. The record emigration of 53,900 is a dramatic increase from the same period a year before when 46,450 New Zealanders moved to Australia - itself a record at the time. “These are economic refugees,” New Zealand Council of Trade Unions secretary Peter Conway told The Age. New Zealand’s unemployment rate is 6.8 per cent, little changed since the economic crisis. Australia’s is 5.2 per cent, well down on the peak of 5.9 per cent reached during the crisis. New Zealand wages are around 20 per cent lower than Australia's when measured in terms of purchasing power. The Closer Economic Relations agreement with New Zealand means Australia is unable to control its trans-Tasman border. It is required to accept as permanent or long-term residents as many of New Zealand’s 4.4 million residents as want to move here...If present trends continue Australia’s annual intake from New Zealand will exceed 100,000 within five years. New Zealand’s immigration minister was himself in Australia yesterday. Nathan Guy told The Age he didn’t normally comment on external migration as his role was looking after people coming to the country. The Statistician says New Zealand has had no net arrivals over the past year. It has taken in 14,000 migrants from the United Kingdom, its biggest source of arrivals, and 14,000 from Australia, almost all of them returning New Zealanders, resulting in a net outflow of 3800 and a net outflow to Australia of 39,800.
. What if Australia moved east? The boost to retail spending flowing from $2.85 billion in government handouts in May and June appears to have ended with the new financial year. Reserve Bank board minutes released yesterday cite retailers as saying the household bonus payments had a “noticeable effect on sales”. But The Age understands that at subsequent liaison meetings retailers have told the Bank sales slumped in July as the reality of carbon tax sunk in. Most of the $2.85 billion delivered to households in May and June was intended to provide early compensation for the carbon tax, but government advertising obscuring its purpose referred to it as “household assistance” and “cash for you”. Retailers have told the Bank conditions after July 1 were more sombre, suggesting the July retail figures, due in September, will unwind the back-to-back 0.8 and 1.0 per cent retail spending gains seen in May and June. The Bank says while the full effects of its four recent rate cuts are yet to become apparent, it sees “tentative signs” of a pick-up in the housing and also a noticeable pick-up in business credit. It expects resource investment to continue to climb for the next year or so. The “eventual decline” should be roughly offset by a build up in export volumes as projects are completed, and “a gradual strengthening in some parts of the non-resource economy that had been relatively weak”. It notes “a good deal of uncertainty” surrounding the timing of the forecast shifts. Deutsche Bank economists Adam Boyton and Phil O’Donaghoe said the Bank was too optimistic in its outlook. Australia’s terms of trade were set to slide 15 per cent throughout 2012. In the past fifty years there had only been five such declines. In three of them Australia had entered recession. The prime minister’s special advisor on Asia has blasted the quality of Australia’s education system saying it has created Australians so ill-informed many who visit Bali don’t realise they are in Indonesia. Dr Ken Henry, the former Treasury secretary, told a Canberra forum debate about education was substandard and going backwards. Dr Henry said he found it “quite extraordinary” that fewer high school students studied Indonesian today than did in the 1970s. “It is is particularly extraordinary when so many more of us are traveling to Indonesia, although I sometimes wonder how many of those people who travel to Bali realise that they are in Indonesia,” he said. Australia was doing well at the moment because it was selling a “homogenous minerals commodity to a minerals hungry industrialist"... but it would soon need to design and market sophisticated personal services to what would become the biggest middle class in history. Universities were failing to properly prepare students for an Asian future in part because the funding formula encouraged them to “get as many bums on seats as they can”. The part of Australia’s education system that should be cherished was the part that produced graduates who could think creatively, although Dr Henry said he wasn’t quite sure whether that happened because of the education system or in spite of it. The Coalition's scare campaign about the impact of the carbon tax has failed to convince financial market traders who back their judgements with money. Ahead of the introduction of the tax in July Opposition leader Tony Abbott claimed its impact on the cost of living would be “almost unimaginable.” His Treasury spokesman Joe Hockey said it would “drive up the price of everything." In contrast the government predicted a one-off boost in the consumer price index of 0.7 per cent in the September quarter followed by a 0.2 per cent boost in 2015-16. In a Treasury research paper released Friday economists Will Devlin and Deepika Patwardhan use prices in the so-called inflation swaps market to derive the exectations of traders about the price impact of the tax. Inflation swaps allow one trader to agree to pay another the inflation rate on specified sum in return for a price. It is worth $12 billion per year. The research paper says inflation swaps pricing is a good guide to what the market actually thinks will happen because it "reflects the collective actions of actors who have to back their views by putting their money where their mouths are". Their analysis finds the market expects a one-off jump in inflation of between 0.6 and 0.7 per cent followed by a return to the previous rate as forecast by the government. The first TD Securities Melbourne Institute inflation reading since the start of the tax in July showed a total price increase for the month of just 0.2 per cent, even after accounting for a jump in electricity prices of 14.9 per cent and a jump in household gas prices of 10.3 per cent. The first Bureau of Statistics reading since the start of the tax will be available in October. Treasury boss Martin Parkinson has raised the prospect of new taxes on presently-untaxed activities, saying the days of big budget surpluses are gone forever. In a sombre assessment of Australia’s tax position - the second in a fortnight from a senior Treasury official - Dr Parkinson told a corporate audience in Brisbane Australia would soon be unable to meet demands for new government spending from its existing taxes. “These are expected to deliver less revenue as a proportion of GDP, given capital and labour will become more mobile and the costs of securing that revenue will increase,” he told the Committee for the Economic Development of Australia. The Treasury Secretary's warning against attempting to squeeze more out of existing taxes did not extend the goods and services tax. 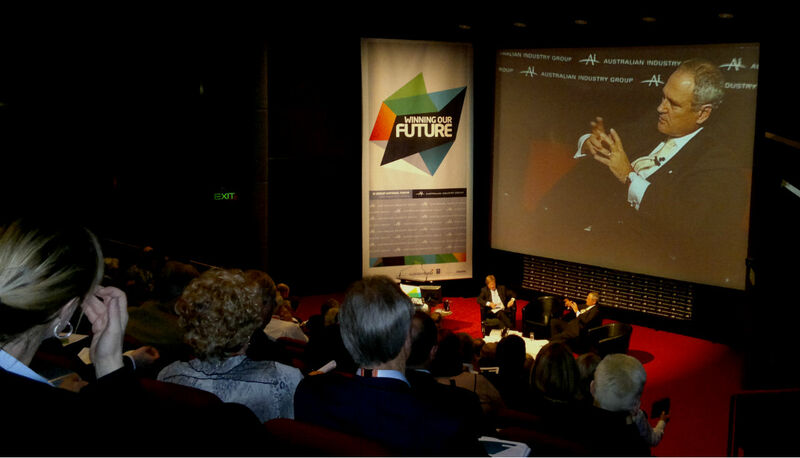 Earlier this month Rob Heferen, head of Treasury’s revenue group, told a Canberra audience Australia undertaxed the consumption of goods and services compared to other developed nations but said “a sustainable rebalancing” would need to gain community acceptance. Australia’s terms of trade have since peaked and economic activity is shifting into forms that can not be as easily taxed. “The takeout message is that the days of large surpluses being delivered by buoyant tax receipts are behind us,” he said. This was happening at a time when rising incomes propelled Australians to demand more of government. So called “superior goods” such as health, disability care and education were rising were becoming more important. The aging of the population would only exacerbate the pressures. Dr Parkinson said his own department was already attempting to do more with less. “As with a number of other agencies, we have already started the process of downsizing. Indeed, we are reducing staff numbers by over 20 per cent by mid 2014, a reduction that some business stakeholders are already noticing,” he said. Treasury has commissioned a panel of outside experts to review the quality of its macroeconomic and revenue forecasts.
. We need more tax. Penny Wong didn’t tell the half of it.